A Sound Garden, by Douglas Hollis, is an installation of 12 tower-like structures in the National Oceanic and Atmospheric Administration's Seattle location, near Warren G. Magnuson Park on Lake Washington, a few miles northeast of the University of Washington . It is a part of that NOAA facility's Art Walk, which contains 4 other pieces in addition to A Sound Garden . The structures contain pipes that generate a wide variety of sounds, depending on how fast the wind is blowing and in which direction . As the area that A Sound Garden is usually windy and the winds can vary greatly, you'll almost always hear something if you pay the piece a visit and you're unlikely to hear it play the same patterns of sounds if you visit it more than once. Actually visiting it doesn't come without hurdles, though: Since the attacks of September 11, 2001, the NOAA facility and all of the art pieces on it, including this one, have been placed under semi-restricted access. It can still be visited for free, but there are a lot of things you can't bring with you and any bags you carry will be searched on entrance to the facility  . Although the pitches and "notes" played by the pipes vary a lot, the sounds generated by the pipes almost always sound similar, as they would for any instrument: The notes usually take the form a loud, whistling, moaning, howling sound, which can be both beautiful and a little bit eerie to listen to. Though there are five pieces of Art on the NOAA Art Walk, A Sound Garden is by far the most popular. In part, this is because the sound aspect of it makes it the most interesting but it is also notorious because The Seattle Grunge band Soundgarden named itself after it. Viewpoint Terrace or Berth Haven are not very good names for a band! The artist, Douglas Hollis, who styles himself as a "Sound Sculptor"  has done many other aeolian public art projects, including Singing Bridges on the Niagara River and Aeolean Harp (2013, video below) at the Exploratorium on Pier 15 in San Francisco . Very interesting artwork, it's neat that it's local! You did a great job describing what it is and where it is located and it's ties to pop culture are pretty cool too. Just wondering, are the pipes purely artwork or do they serve any secondary/functional purpose for the NOAA like taking atmospheric or wind readings or anything? 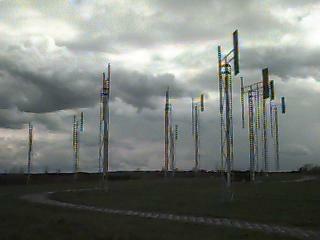 Either way it's a fitting place for the artwork since the artwork is reliant on input from atmospheric changes (wind.) You start to get into that as you discussed how the wind causes changes to the pitch and sounds but I think you could go further with the analysis of why NOAA was the location chosen for these artworks and why it's so fitting. Near the end you compare it other works by the same artists but there's definitely room to expand on what makes them similar and it might be nice to add hyperlinks to the artworks you mentioned. Great job! I found this post to be very interesting and it is great to see another local art installation. I feel as though I have seen this work once before up close but there was no wind at the time so there was no notes and I was unsure of what I was actually looking at. It is cool the incorporation of the natural forces that we encounter on a regular basis, such as wind. I wonder if the strength of the wind would vary the tone that resonates from the towers? Great post, it makes me want to visit the structures again even though there is the strict security.